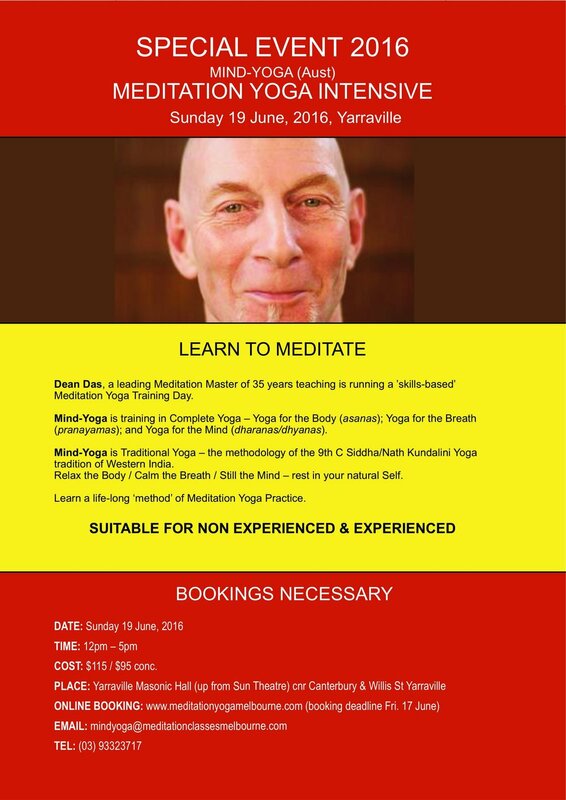 DEAN DAS is the founder of Mind-Yoga (Aust). 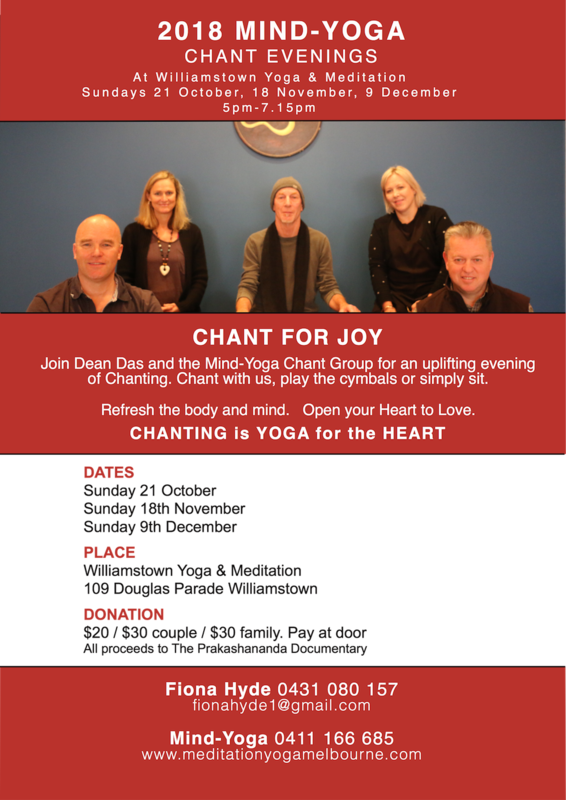 Dean Das is a Western-born Meditation Master, teaching for over 35 years. Dean Das commenced practicing Yoga at 15 years of age. In 1974, he met the great Siddha Yogi, Swami Muktananda Sarasvati who was visiting Australia. Upon meeting, Muktananda instructed Dean Das to travel to India, and live in his Ganeshpuri Ashram. Through most unusual circumstances, Dean Das was led to his Guru, the revered Siddha Master, Swami Prakashananda Sarasvati ('Babaji') of Sapta Shringi Devi mountain, Western India. Dean Das lived with his Guru in a 'father-son' relationship (discipleship) for 7 years at his remote Ashram atop Sapta Shringi mountain, Nasik District, Western India. He was initiated by his Guru as a Bramachari Sannyas of the Sarasvati Monastic Order. He underwent the sadhana (‘the inner process’) called shaktipat, (transmission of spiritual energy) leading to the state of consciousness known as Samadhi (Self-Realization). In 1982, Dean Das returned to Australia and resumed a householder life. He worked as a University academic, a Mental Health Specialist, and as a Private Consultant / Expert Witness to State and Federal Courts in the field of Criminology/Forensic Psychology. It was in 1980, that his Guru Swami Prakashananda (Babaji) prophesied that ‘Dean Das will take my name around the world through the teaching of Meditation’. Dean Das taught Meditation Yoga in Western Australia, and established Mind-Yoga (Aust) in Melbourne, January 2010. Mind-Yoga (Aust) is dedicated to training serious students the practice of Meditation Yoga taught within the tradition of the 9th Century, Siddha/Nath Yoga lineage of Western India. SWAMI PRAKASHANANDA SARASWATI ('Babaji') meaning 'revered father', lived at the top of Sapta Shringi mountain for 27 years, an isolated mountain range dedicated to the the Devi (Mother Goddess) near Nasik, Western India. Living in a cave for the first 7 years, gradually The Shree Gurudev Ashram was established to feed, house, and educate many young children from poor families. In residence was small group of Hindu sannyasins (monks), and the occasional Western yogi. Many hundreds of devotees throughout the years climbed the 3.5 to 4 hours steep mountain paths to receive Babaji’s ‘darshan’ (blessings). In 1988 Babaji left his body. He was a revered Siddha Yogi (God-Realized/Self-Realized Yogi) recognized throughout India, who had a profound impact upon all who were fortunate enough to meet him. He was described as 'the living embodiment of Love'. (Recommended reading on Swami Prakashananda Saraswati is 'Agaram Bagaram Baba' by Titus Foster, and 'Storytellers, Saints, and Scoundrels' by Kirin Narayan, listed in Menu under 'Book References'. For direct purchase of these books, simply email: mindyoga@meditationclassesmelbourne.com and the book will be posted to you.